At ComplexCity Spa we use the most advanced treatment options to maximize results, while assuring that our client’s safety, comfort, and confidentiality remain our priority. 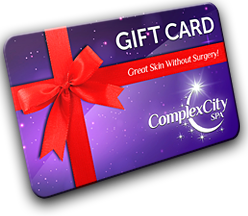 ComplexCity Spa was created for those who insist on the latest and most effective aesthetic treatments. Our prime focus is not only to provide the customers with beautiful and glowing skin but also to consider the crucial health of the skin as well. What kind of treatment we offer? We offer state of the art treatment combinations that was specifically developed to improve different skin problems. Click HERE to know more about our treatments. What kind of product do we offer? Our products were specifically created for different skin conditions. We developed four product kits to help multiple skin problems. ComplexCity products are very effective, unique and innovative. Click HERE to know more about our products. Yes, absolutely. We integrated a powerful appointment system in our website so you can make an appointment anytime from your PC, Tablet or Cell Phone. Can I order my favorite product online? Yes, Absolutely, We have a high quality product line for all your skin needs. You can chose any product from our menu and make a secure order online. VIP Membership is $49 per month. Become a ComplexCity Spa VIP Member today and receive a host of benefits. Receive a monthly VIP Store Credit of $49 valid for use in all our VIP services and products. Receive 20% discount on Skin Care, Anti-Aging, Laser Hair Removal and Body Treatments. Receive 20% discount on Skin Care Products. Earn points with every purchase and redeem in future orders. This exclusive VIP Membership is good for clients that would like to benefit from our services on a regular basis at least once a month. Note: VIP Store Credit of $49 has to be used towards VIP services and Products and it can’t be transferred over to the following month. Earn points with every purchase and redeem in future purchases. FREE Members and VIP Members win points when they book a service or buy a product online. Each dollar spent represents 1 point. Points are added to your account with each purchase. Once you have more than 100 points you can start to use these points as discount in future purchases in our shop. Is CompexCity Spa available for a franchise opportunity? Yes. We have a complete franchising program. Please click HERE to know more about ComplexCity Spa franchise. Where is ComplexCity Spa located? Our headquarter is based in the beautiful city of Hollywood, Florida. We proudly serve clients from Miami, Fort Lauderdale and all South Florida area. If you have any question that are not on this page please don’t hesitate in CONTACT US. At ComplexCity Spa we are always ready to help!